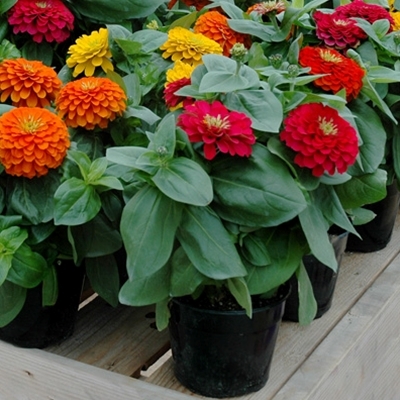 Ornamentals News: Bold and Beautiful Zinnias for Container Gardening! Bold and Beautiful Zinnias for Container Gardening! 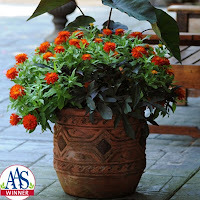 While zinnias are considered a home garden staple, they're often overlooked for patio container gardening. 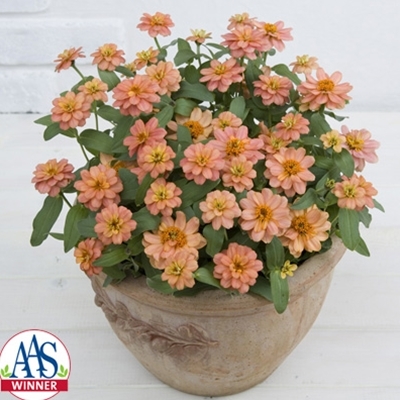 A number of the more dwarf zinnia varieties lend themselves well for patio planters, adding both texture and brilliant color to your outdoor living space for the entire summer. Profusion Double Deep Salmon (right) - If you're looking for a little more subtle color scheme, then this garden award winner is for you. Attractive medium to deep salmon double flowers cover 16-24" wide plants, ensuring you a full blooming container that will last well into fall. For a combo planter, combine it with pastel petunias, dichondra, or euphobia for a soothing color palette and additional texture. Magellan Mix (left) - This spectacular mix of 8 different colors offers you ample opportunity to grow multiple plants together in large planters, or one or two plants in smaller containers. Clear bright 4" double flowers bloom on 12-14" bushy well-branched plants that grow to 10-12" wide. Try pairing a few plants together with trailing foliage such as Carnival (Ipomoea) or asparagus fern for a nicely balanced planter. Zahara Double Fire (right) - This beauty is guaranteed to add colorful zest to any container! Highly branched plants result in a beautifully symmetrical plant habit loaded first with buds, then with consistently double fiery orange-red flowers. Plant it on its own, or pair it up with other annuals in yellow or blue shades, depending on how "hot" you want your planter to be!